Today’s session was going to be a wet one. The weather forecast was set between light – heavy rain all day. Still a day on the bank is better than a day in the house, and after my recent sea fishing trips I was looking forward to a trip where I knew I would actually catch some fish. I decided to visit a new lake at a venue is visited recent. Lower Lake at Higher Farm, Wincanton. Apparently this lake was where the big fish lived, so naturally I was excited. I set off early making sure I had the waterproofs in the car and was oddly glad that it was raining as it would give me an opportunity to test drive my new waterproof fishing coat. Finding the lower lake was easier than finding the higher lakes, (big gate and signed) and after parking up I found that I would be sharing the lake with 3 generations of anglers, all trying to out catch each other. I opted to leave them duke it out and chose the last peg on the lake. It looked to be one of this more inviting pegs on the lake, with margin features to right and left and an island to the left at 11.5 – 13m. Off to a damp start, but I was optimistic. ● Topkits 1 + 2 (Solid 14 and 16 Elastic) 0.3g float – 5lb Fox Micron line to a Size 16 or 14QM1 hook on a band. ● Topkits 3 + 4 (Solid 10 + 8 Elastic) 0.4g float – 3.12lb Reflo power line to a Size 16 Kamasan B911 hook. After fishing the lower lakes I assumed the higher lake would be similarly well stocked and opted to fish towards to island for Carp, then alternate between island and right margin depending how quick the action was. I was glad of the waterproofs. It was chucking it down. I balled some truly sloppy pellets both at the island and in the margin and then shipped out over the top with a banded 6mm pellet. Despite the weather and the fact that winter was definitely on full flow the Carp in this lake were hungry. After a few minutes and several line bites the float slipped away and I was into a Carp of around 3lbs. Not the “lump” I had been expecting, but I was off the mark. The bites were nowhere near as fast as they were on the higher lakes, but then again that was a long while ago and it was definitely colder. I switched to an 8mm pellet and shipped out to the island. There were lots of lines bites, then after 5 minutes the float took off like a missile and on striking the fish I was attached to was having other ideas, and steamed off around the island. There was no stopping this fish and after a few more seconds the hook pulled, and the elastic came pinging back into the top 2. Good job the section was under the water as something may have gone crack! I noticed that in the process of hooking that freight train I had spooked the other fish out of the swim. I balled in a conker sized ball of mixed pellets, then switched topkits and shipped out down the margin with double dead red on the hook. 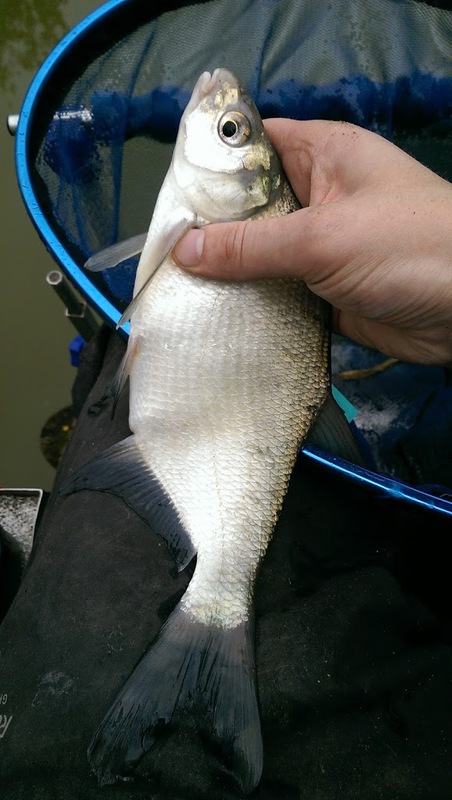 The float bobbed for a minute or so before slipping under and 30 seconds later I was netting a smaller skimmer. Shipping back out with treble dead red I managed a very greedy Roach. 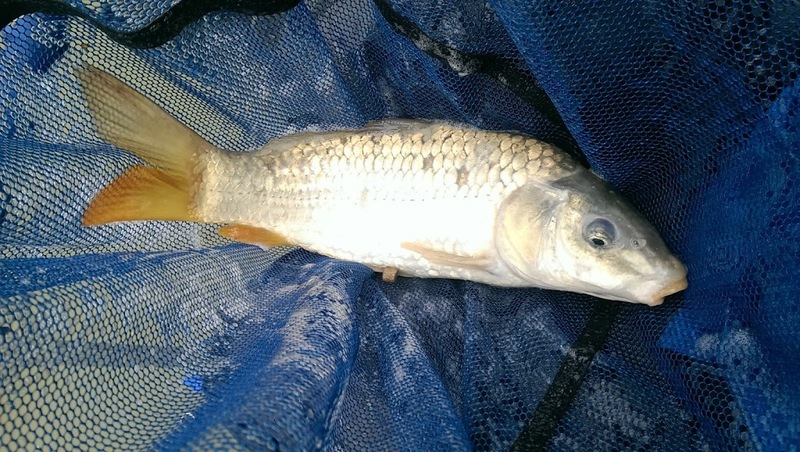 I was just wondering if the silver fish preferred the near bank and the Carp the island when the 8 elastic shot out and I was into a Carp of around 2lb. That tested the elastic to say the least, and it kept lunging for unseen underwater snag! I swapped to the 10 elastic and hooked on a 6mm expander pellet. The next fish was a surprise Tench of around 1 ½lb which proved to be too lively to hold and flipped out of my hand, avoiding the keepnet and plopped straight back into the lake! Another 10 minutes down in the margin and my swim was quietening down. I switched back to 8mm hard pellets and shipped back out to the island. A 5 minute wait and a bit of pellet jigging and I was in to another Carp. This one was about 3lbs. I was really grateful that I had my waterproofs, as it was now constantly hammering down. My side tray was filling up and despite my best efforts after 3 hours of fishing all of my hookbaits were well and truly saturated. I however was bone dry and incredibly toastie! My coat and trousers were passing this test with flying colours. Another 20 minutes and 3 fish later and the wind was also starting to rise, so I decided to wind up my session and head home in time for lunch. 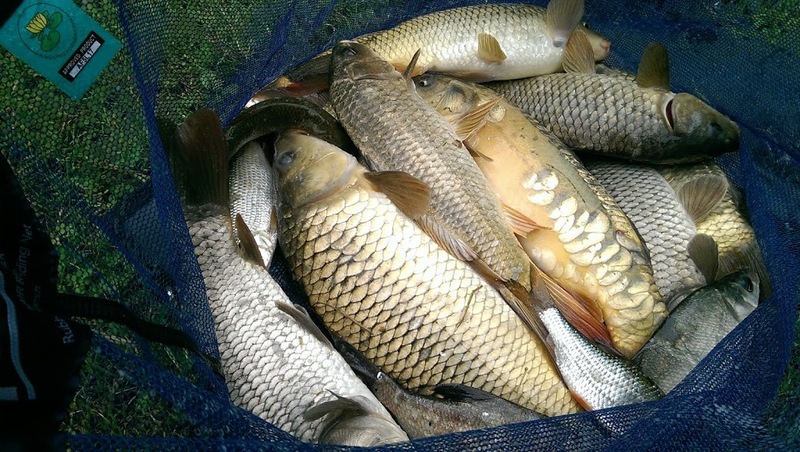 I rounded up my session with a Gudgeon which took 3 dead maggots. 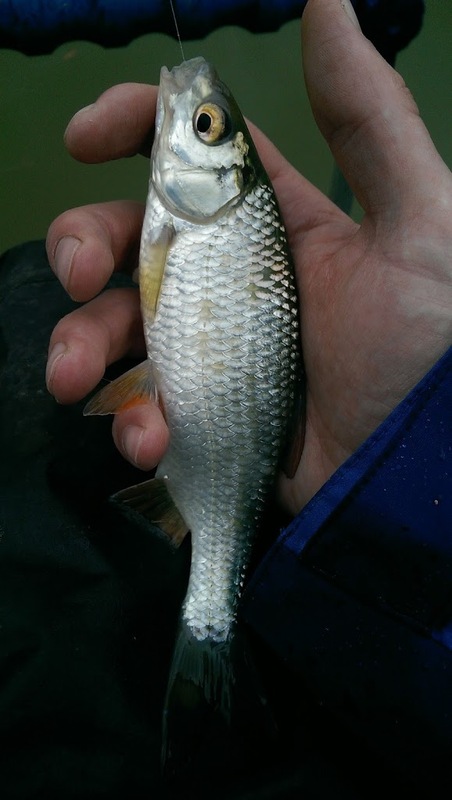 That too proved to be a lively critter and wriggled from my hand back into the lake, avoiding the net! The biggest fish came in at just over 5lbs. I pulled up the keepnet and the youngest angler to my left came over for a look. I guessed at around mid 30lb’s but I wasn’t keeping track. He looked in at the net and seemed genuinely interested in how I was catching the fish, and how the pole worked (they were all on rod and line). So I quickly explained while packing away and gave him my remaining dry pellets and some bands, which he promptly ran off to try. Higher Farm Lower Lake is a nice lake to fish and I particularly liked the large disabled access peg close to the car park. In my opinion more fisheries should offer these pegs, as they really are a fantastic idea. As for the lake itself, I didn’t encounter any lumps as I expected, but the few hours I fished were largely enjoyable despite the rain. Access to the lake was through a reasonably well signed gate with parking for at least 6 cars close to the lake. The peg I fished was furthest away and pushing a chair would have been difficult, however the pegs closest to the car park are easily accessible to all. I would recommend Higher Farm Lower Lake to anyone looking for a consistent days fishing, without it turning into a hauling session as so many commercial fisheries now often do. It also comes with the added bonus of being a reduced rate to Yeovil Angling members. Ideal. Accessibility ***½ – Easy to find and park. 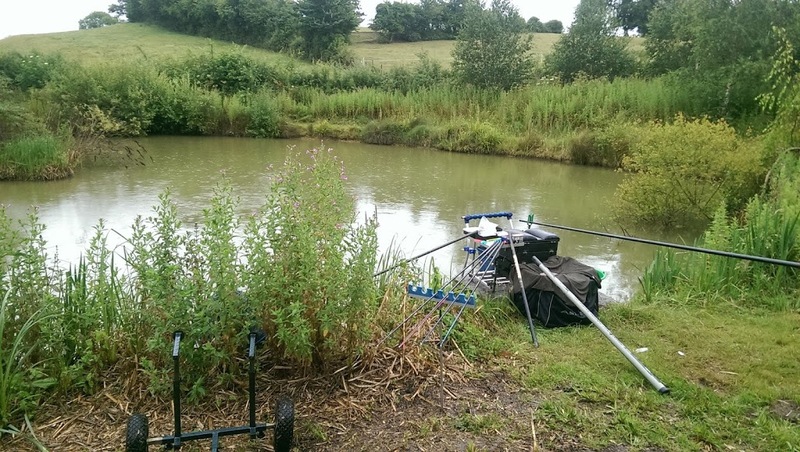 Fishability *** ½ – Good fishing, nice lake with a solid head of fish, without it being daft. Disabled Access – ***½ – You can park close to the lake and get onto the large disabled access peg fairly easily. Moving further down the lake would be difficult but not impossible with help. There are so many venues in this neck of the woods. Although new venues are always exciting if you are going to make the drive then I'd go for Todber Manor.